Did you ever imagine living in New York? The Alex Hotel is a stylish, contemporary luxury hotel with well-appointed suites; has an excellent restaurant named Riingo; and incredible views of the Chrysler building that will make every guest feel like a New Yorker. Staying in a corner 2-bedroom suite at The Alex Hotel (130 suites and 70 rooms) in late October 2008 had the feel of living in an apartment in New York. The suite had excellent appointments that included two bedrooms, a living room and eat-in kitchen, and two bathrooms. The kitchen had top of the line amenities including a Gaggenau cook top, GE Profile microwave/convection oven; dishwasher, Sub-Zero refrigerator stocked with bottles of water, wine, and other items normally found in a mini-bar; Cuisinart pans, china, crystal, and cutlery. Although I did not do any cooking during my stay, I did use the microwave to make tea for Edward and I to enjoy while we were relaxing in the living room. The dining area featured a round glass, metal, and wood table that was accessorized with the hotel's signature orchid in a round bowl with smooth black pebbles, and two brown leather chairs flanking the table. The living room area had brown velvet window treatments and ivory sheers on the wall of windows that I opened to enjoy the spectacular view of New York from the 14th floor of the hotel. There was a mushroom leather corner sectional with beige and burnt umber decorative pillows, and a dark chocolate leather chair with chocolate velvet cushion flanking a round wood and metal coffee table. There was ample lighting with a floor lamp with a print on print geometric pattern shade that matched the light hanging over the dining room table. An interesting feature of the living room was that the work area and desk, as well as the Sharp Aquos flat panel television with DVD/CD, could be hidden by closing the cabinet doors. 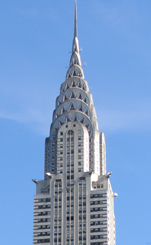 The suite had two bedrooms, a smaller bedroom with a queen bed, and a larger, corner bedroom with a king bed, a leather chaise, and a view of my favorite building in Manhattan, New York's iconic Chrysler building built between 1929 and 1930 in the Art Deco style, and stands at an impressive 319 meters (1047 feet). From our window Edward and I could see the radiating terraced arches, gargoyles, and eagles, and adornments that were modeled after Chrysler hood ornaments and 1929 radiator caps at the corners of the building. The beds were well dressed with white fabric headboards accented with tan wool coverlets, inviting Frette linens, white duvets, and a selection of pillows. Nightstands flanked the beds, and brown velvet window treatments and ivory sheers framed the wide expanse of windows with impressive views of New York. 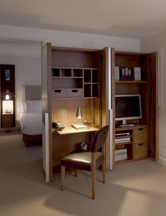 The larger bedroom also had a Sharp Aquos flat panel television. There were two limestone bathrooms, one located off the foyer with a walk-in shower with rainshower head, and the other located off the master bedroom that had a combination tub and shower, and a Sharp television. Other appointments included a hairdryer, vanity/shaving mirror, Frederic Fekkai amenities, Frette waffle weave robes, and The Alex Hotel's signature orchids in square bowls. Closets space is very important in New York where shopping beckons from the prestigious luxury stores along Fifth and Madison Avenues to the boutiques of SOHO, and the suite had ample closets in the foyer, and in the bedrooms, which held conveniences of slippers, umbrellas, a safe, iron and ironing board, and lots of hangers. 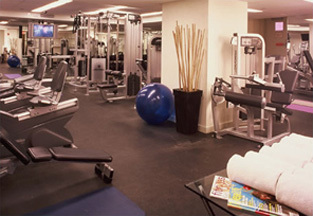 Like the lyrics in the song, "New York, New York "... the city that never sleeps," The Alex Hotel understands the needs of its guests and the diverse time zones that they may be experiencing, and as such, their well-equipped Fitness Center, and Business Center, are open 24 hours per day. I must admit that I do not usually use the Internet in the middle of the night or feel the need to exercise at 4:00 am, however it was very nice to know that I could, and during my stay I did use the well-equipped Business Center and found that it was like having my own office in New York. Their restaurant Riingo features Executive Chef Jimmy Lappalainen in the kitchen where the culinary focus is on American and Japanese cuisine. 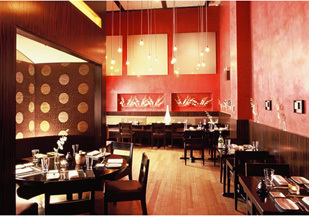 The contemporary décor and ambience is stylish and inviting, and their lounge features an excellent cocktail menu. During our stay at the hotel we enjoyed sampling such innovative cocktails as the Fig Manhattan made with Bullett Bourbon, Fig, and Spices; and the Sparkling Geisha made with Grey Goose Vodka, Strawberries, and Prosecco. As an added enticement, Monday - Friday from 5:00 pm - 7:00 pm the lounge has special wines by the glass and draft beer for only $5.00. We had an excellent dinner at Riingo during our stay where a few of the many highlights included Duck Dumplings with Hot and Sour Fig Consommé; Yellowtail Tuna Tataki; Beer-Braised Short Ribs; Grilled Red Snapper; and their signature dessert, Green Tea Donuts with Green Tea Ice Cream, Fruit Chutney, and Cinnamon Sabayon. 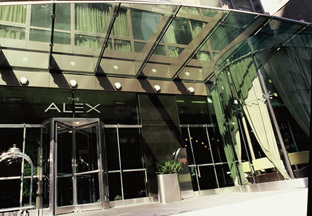 Knowing that parking is a premium in New York, and that the cost of parking can be substantial, for 2009, The Alex Hotel is offering its guests complimentary valet parking with a minimum 1-night stay; check-in after 4:00 pm, and checkout before 11:00 am, to take advantage of this special offer. 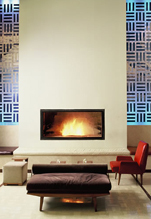 When it comes to making their guests feel at home, The Alex Hotel knows how to create a wonderful New York experience. Combined with its convenient Midtown Manhattan location that is close to shopping, museums, and Times Square, the hotel is only 12 miles from LaGuardia Airport and 17 miles from JFK International Airport, making it perfect for your next New York getaway or business trip. 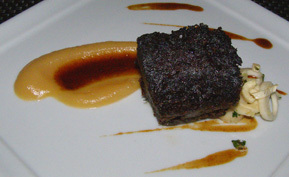 Read other articles on The Alex Hotel and Riingo in the Restaurants and Chefs' Recipes sections. Read other articles on New York in the Destinations, Restaurants, Chefs' Recipes, Spas, and Luxury Products sections.